Unpopular Opinions : Daleks, Face Punching, and "Disproportionate Response"
Daleks, Face Punching, and "Disproportionate Response"
When either of opposing sides in a conflict adopts a Dalek stance of genocide and/or "ethnic cleansing," all civility has been pre-emptively stabbed in the face and the possibility of any peaceful solution becomes zero. 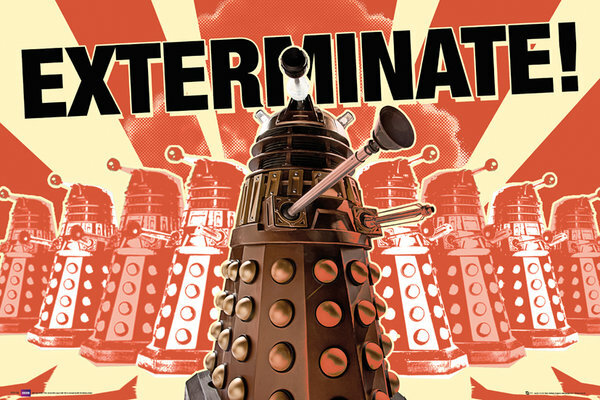 You can't reason with daleks, you can't bargain with daleks, and you'll never be able to peacefully co-exist with daleks, for as long as they exist, they'll try to destroy you and everything you stand for time and time again until they succeed. And that's the catch for them: Good has to be forever vigilant, evil only has to win once. This is the reason why being actually committed to tolerance requires immediate rejection of any philosophy of hatred, and expedient action whenever such hate groups form and acquire power... and if the institutions won't do something about it, you must, physically and forcefully if necessary (for the reading-impaired: Because if you don't, the intolerant ones will kill you, and tolerance dies with you). So, when the nazis' ultimate goal is either to run you out of your own country or kill you, is a "punch in the face" a disproportionate response? How come Arpaio (or the Fergusson killers in blue, or their successors, etc) hasn't been greeted by a lynching mob yet is anyone's guess. The people is not angry enough, not by a long shot. I hope it's not too late by the time they finally are. Peace (just remember the price of peace, just saying).